After Columbia disintegrated during entry on 1 February 2003, NASA grounded the entire Space Shuttle fleet until it could ascertain what had gone wrong and fixed the problem. Whenever an aerospace program is grounded for a prolonged period, the first flight after the grounding is often called the Return-to-Flight. After 30 months of work, NASA launched the Space Shuttle Program's Return-to-Flight-STS-114-using Discovery. This flight was the most photographed Space Shuttle flight ever, with numerous cameras on the ground, ships, and aircraft tracking the vehicle during ascent, and the crew of the International Space Station taking a series of detailed photographs as the Orbiter approached the ISS. In addition, the crew of the Discovery used cameras in the cockpit and on a long, robotic arm to examine almost every inch of the Orbiter. 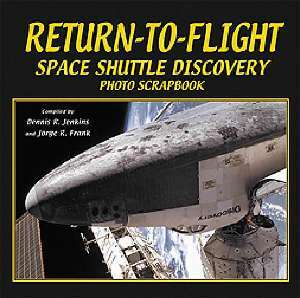 The result was some stunning photography that shows the Space Shuttle in ways that have never before been seen. It is presented here, in full color, as the program readies to fly the second Return-to-Flight launch-STS-121-also using Discovery.